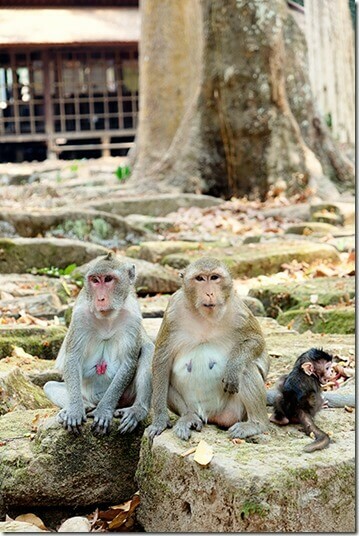 Bayon Temple Pictures & a Bayon Temple, Siem Reap Video! 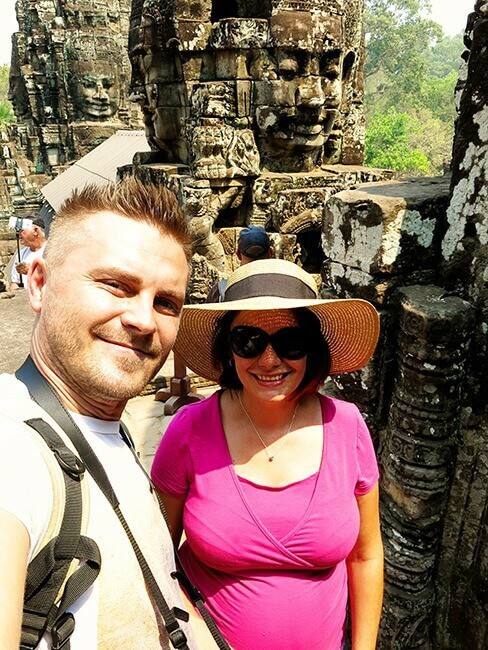 Built by Jayavarman King in the late 12th century to early 13th century, the Ancient Buddhist Bayon Temple at Angkor Thom is a visual time-worn ruin of a mix of spirituality, history and symbolism. 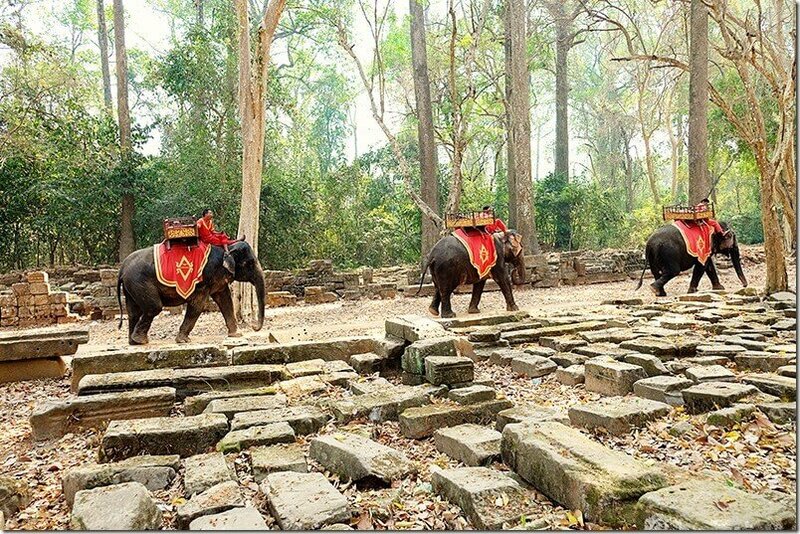 This Angkor Thom temple is one of the most famous after the Angkor Wat Temple itself. 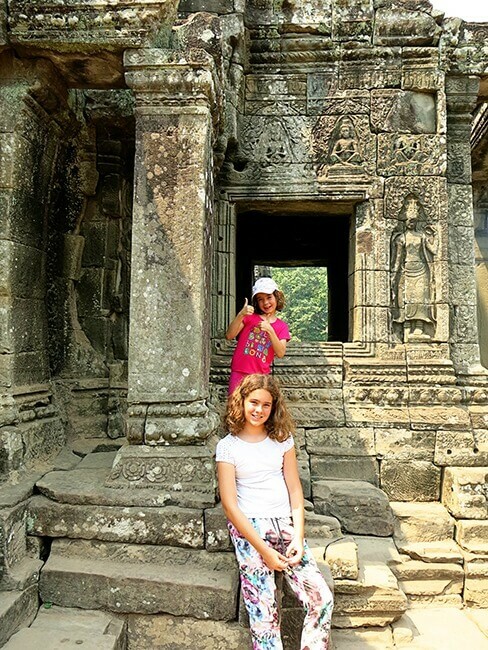 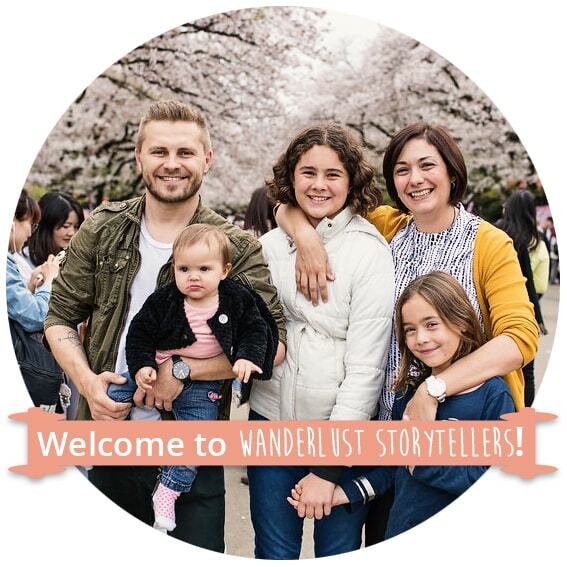 This UNESCO World Heritage Site happens to be one of the most popular places to visit in Cambodia, and we were grateful to have the opportunity to explore the Angkor Archaeological Park with our kids. Whilst the Angkor Thom city is pretty large in size, it was the Bayon Temple that captured our fascination. 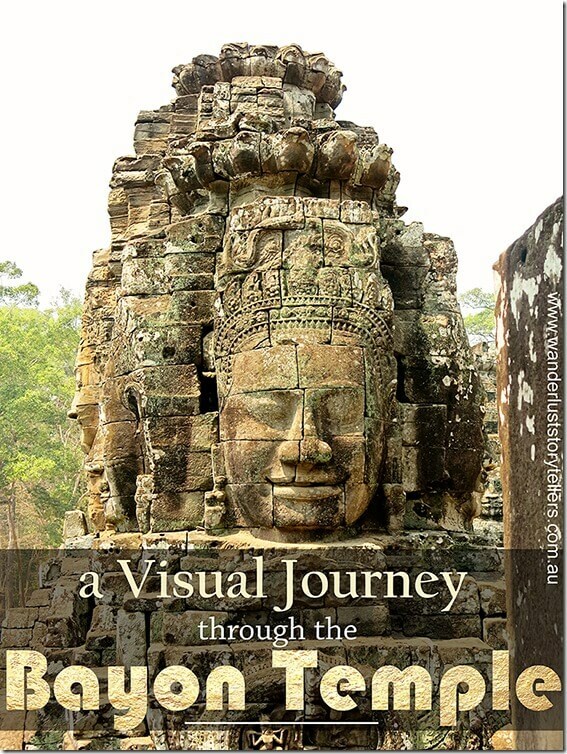 Join us for a visual journey with Bayon Temple pictures and a short video as we explore the temple that has over 200 Bayon faces and over 11,000 carved figures on the outer walls. 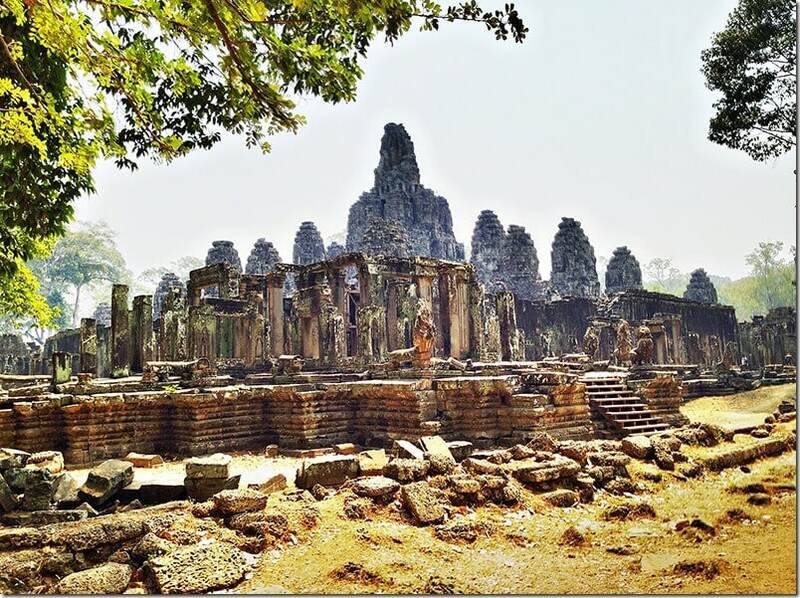 Due to the centrality of Buddhism in the Khmer Empire, the Bayon temple was built in the exact center of the walled city, Angkor Thom. 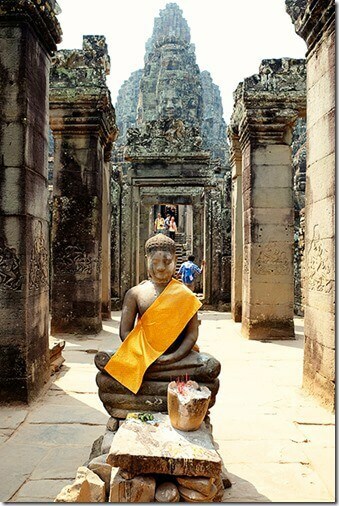 The Bayon Temple, Angkor Thom, represents the intersection of heaven and earth. 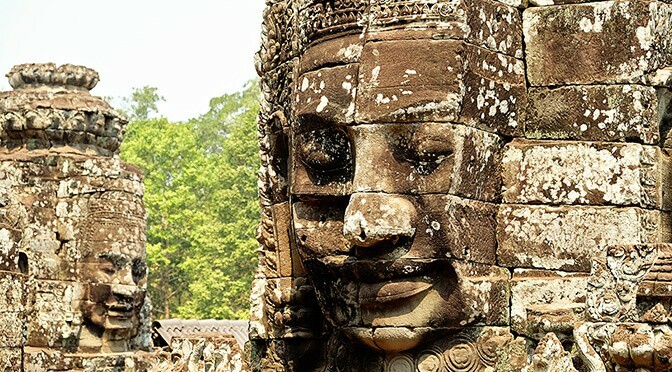 The Angkor Thom Bayon Temple is world-known for its huge stone faces, with one facing outward and keeping watch towards every main compass point. 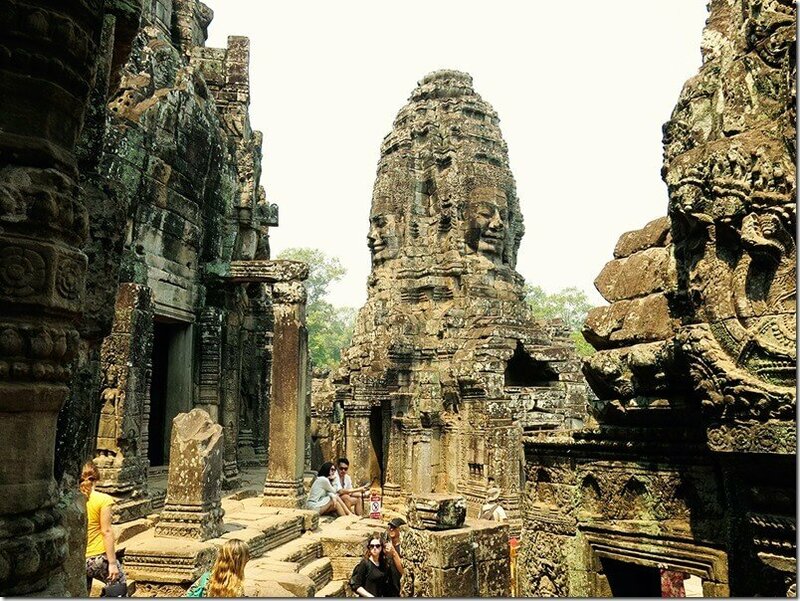 There are 46 smaller towers surrounding the Bayon Temple. 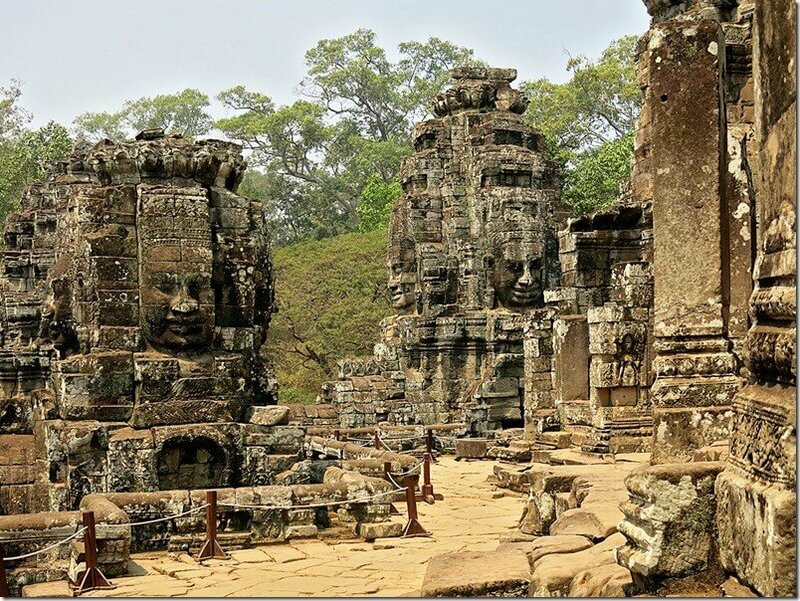 Each tower has four Bayon faces of its own. 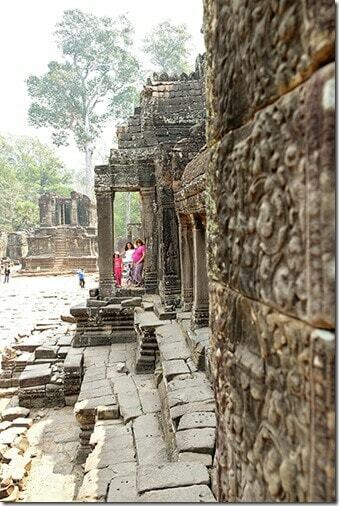 There are two gallery walls surrounding the temple. 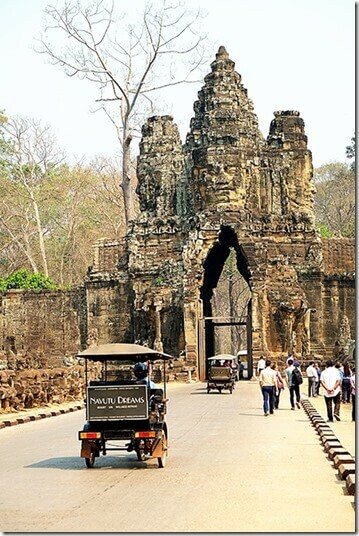 One of these (the outer wall) feature scenes from Khmer history and everyday life. 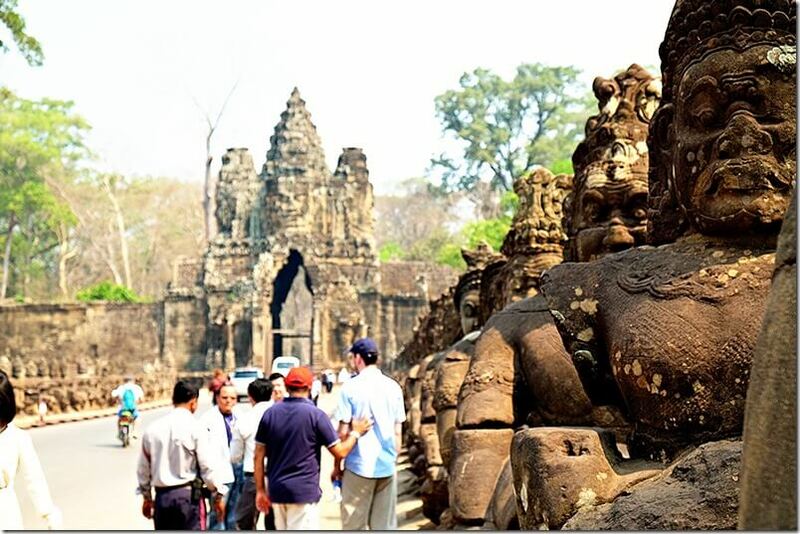 The other wall, the inner wall, features reliefs of Hindu deities, including Brahma, Vishnu and Shiva, as well as scenes from Hindu mythology. 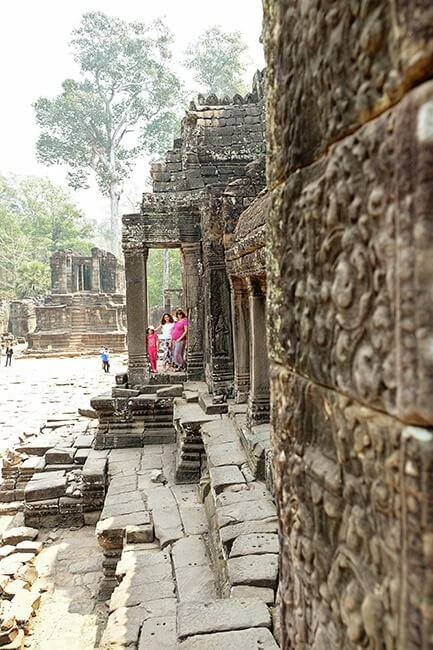 These were not part of the original temple, but was added on as a feature by one of Jayavarman’s successors. 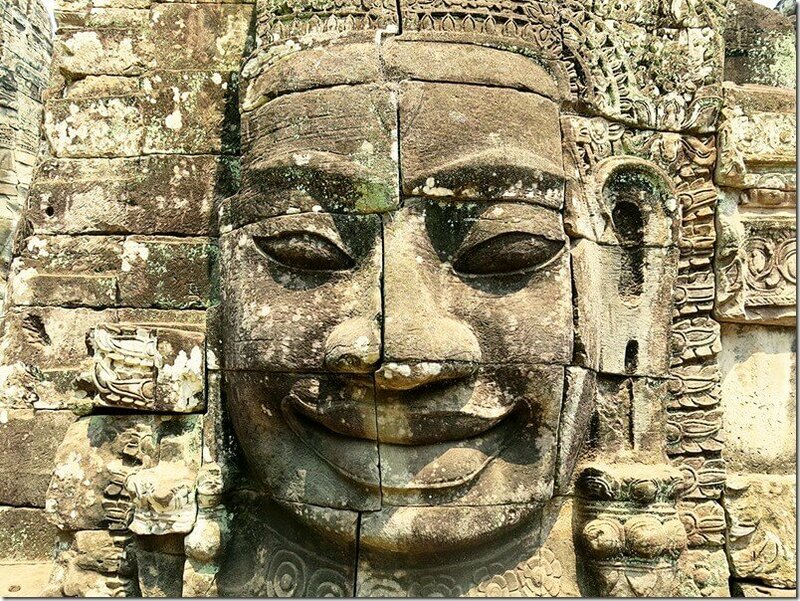 The Angkor Thom Bayon Temple was built around 1190 AD by King Jayavarman VII. 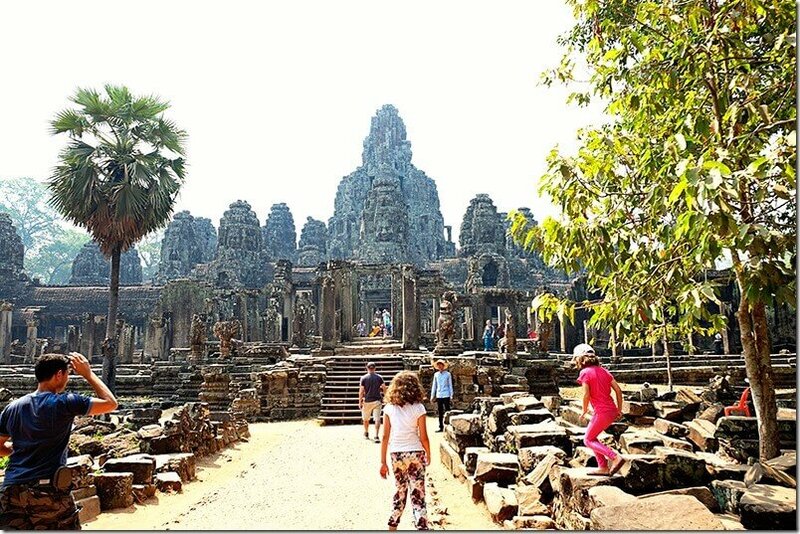 Bayon is a Buddhist temple and was built to be the central temple of the ancient city of Angkor Thom. 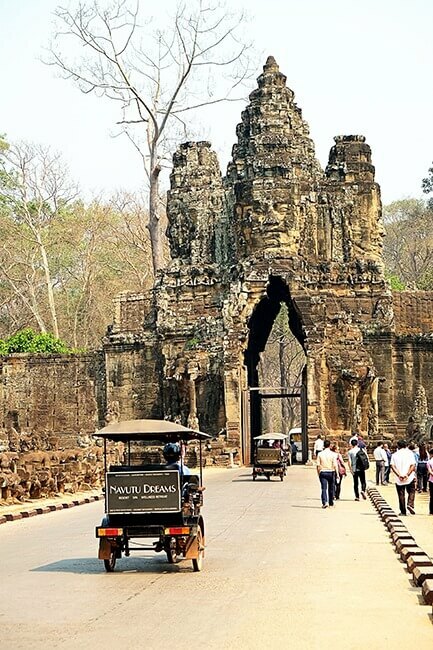 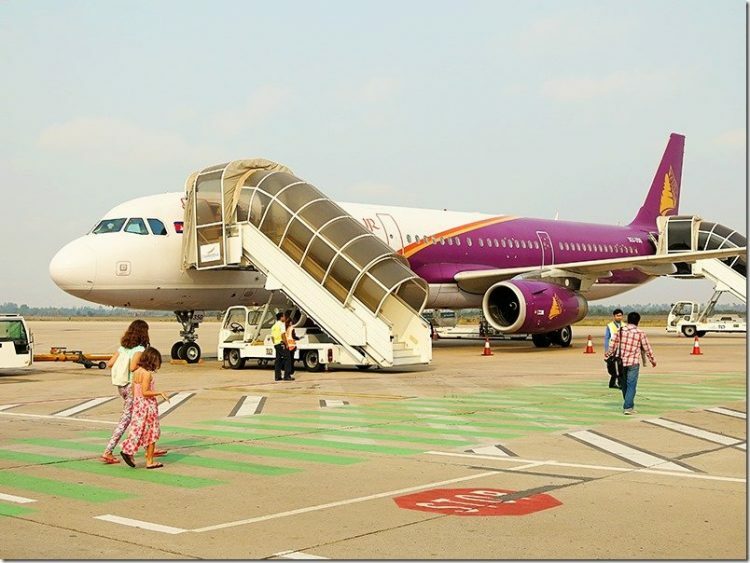 The complex is located just to the north of the famous Angkor Wat and just past the impressive South Gate of Angkor Thom. 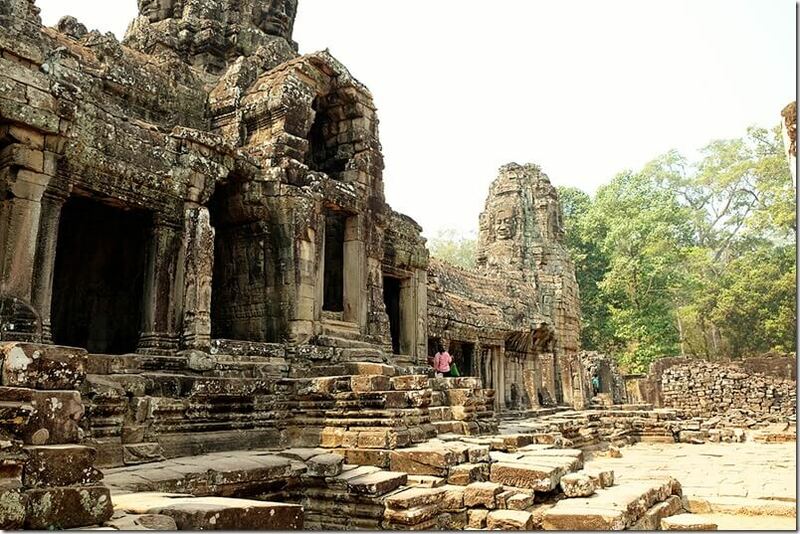 Interestingly this temple was built nearly 100 years after Angkor Wat temple. 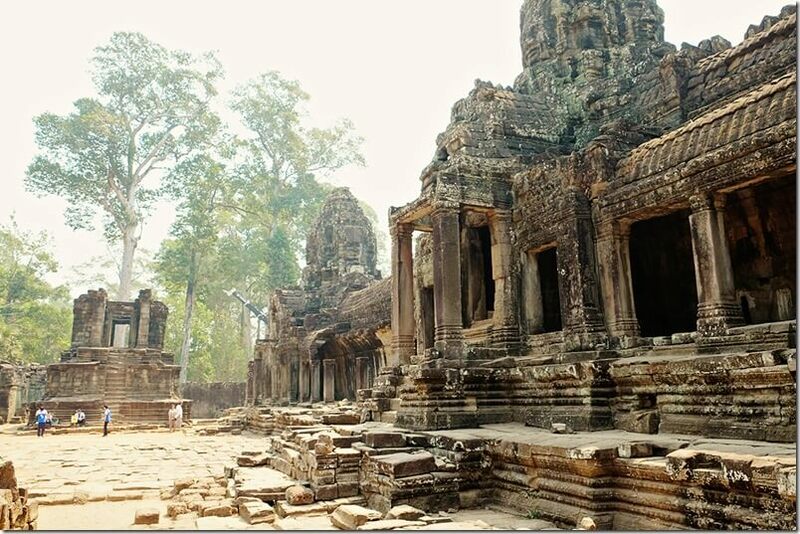 The temple was built with towers, these towers represent the Khmer provinces in the Great Khmer Empire Period. 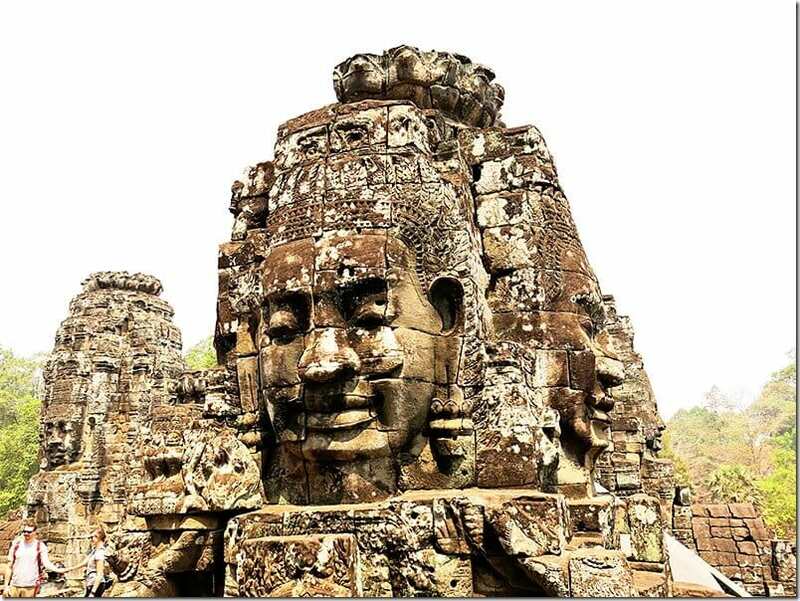 Each has four faces, each smiling; the four smiling face statues is symbolized as charming smile, sad smile, glad smile and beautiful smile. 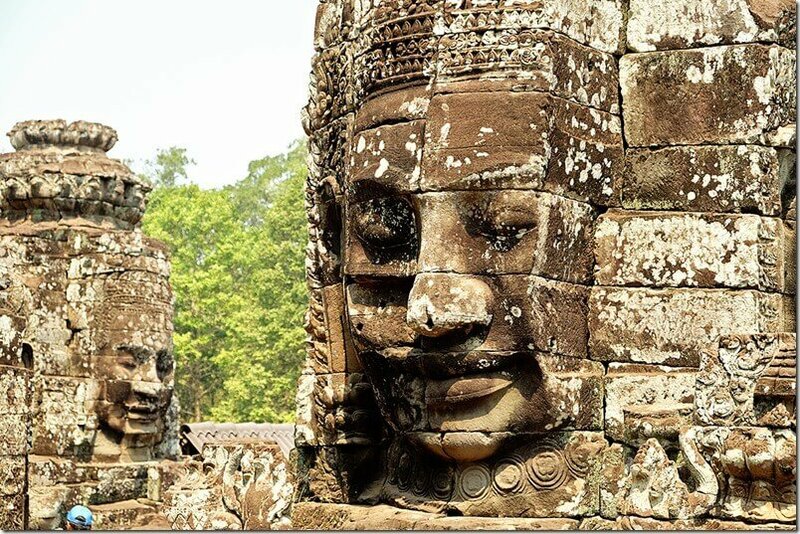 A temple with around 200 faces!! Incredible hey!! 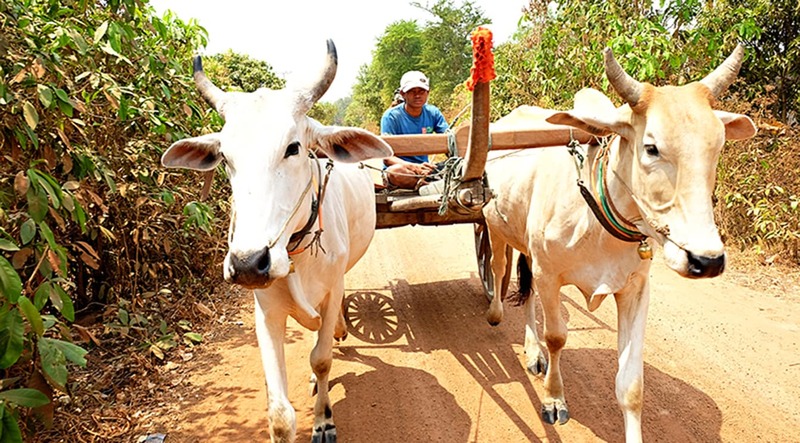 To read more about this temple and its history click to Tourism Cambodia’s site here. 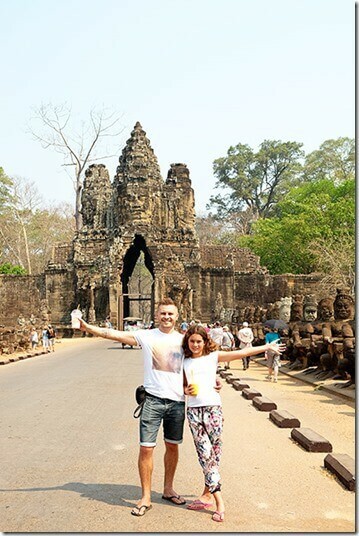 The Angkor Thom, Bayon Temple was one of our favourites!! 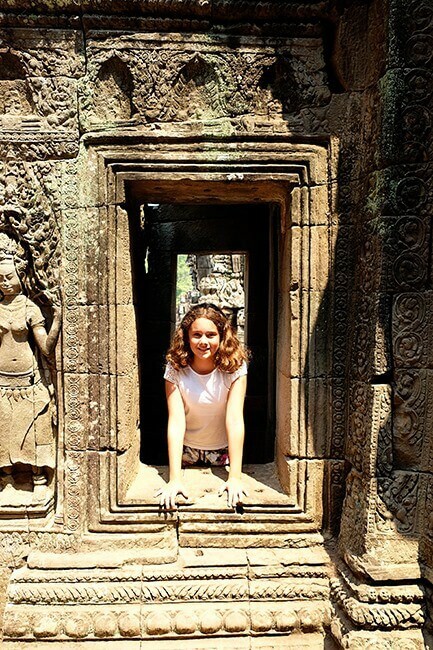 I would even go as far as to say that I enjoyed it more than the Angkor Wat Temple itself! 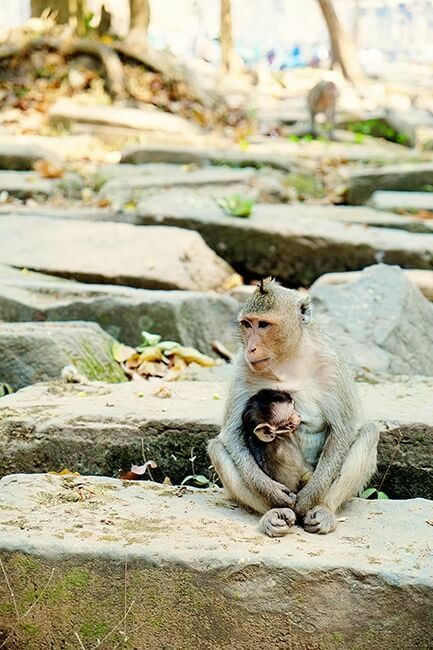 (Shhhhh, don’t tell anyone!) 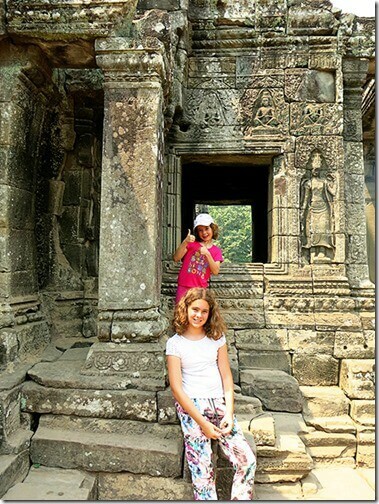 Both the parents and kids alike enjoyed discovering all the Bayon statues, carvings and faces of this incredibly impressive ancient site! We do recommend that this temple should be on your list of temples to see whilst visiting Siem Reap, it is definitely worth your time! 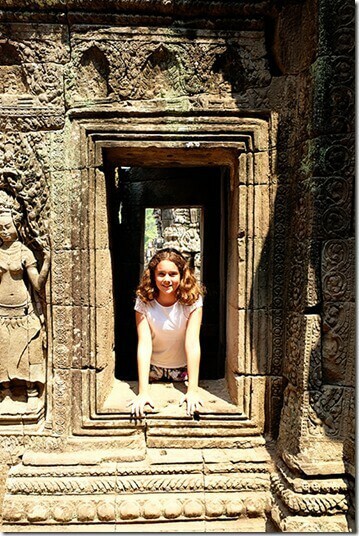 My absolute favourite temple at the Angkor Archaeological Park is coming up next, can you guess which one it is?? I loved Cambodia and you got some great photos. 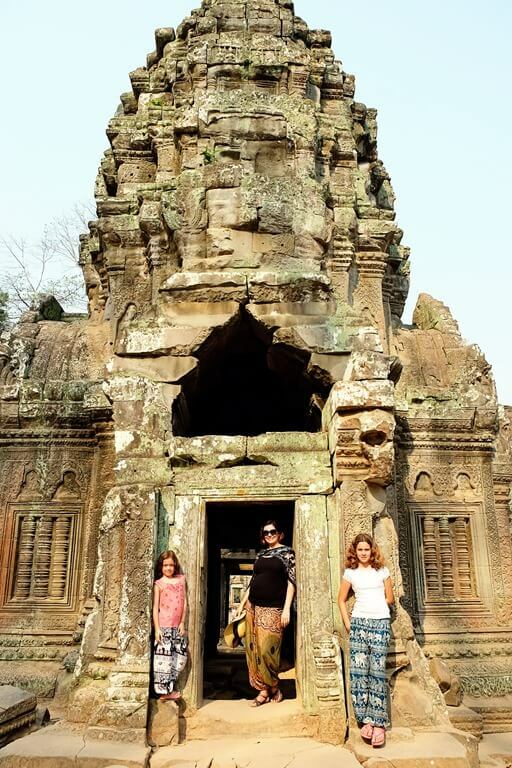 Good to hear everyone enjoyed the temples.